Remote Tinakula lies 100 km NE of the Solomon Trench at the N end of the Santa Cruz Islands, part of the country of the Solomon Islands, which generally lie 400 km to the W. It has been uninhabited since an eruption with lava flows and ash explosions in 1971 when the small population was evacuated (CSLP 87-71). The nearest inhabitants live on Te Motu (Trevanion) Island (about 30 km S), Nupani (40 km N), and the Reef Islands (60 km E); they occasionally report explosion noises from Tinakula. Ashfall from larger explosions has historically reached these islands. The last reported evidence of activity came from MODVOLC thermal alerts between August 2010 and October 2012, and observations of incandescent lava blocks rolling into the sea in May 2012. A new eruptive episode with a large ash explosion and substantial SO2 plume during 21-26 October 2017 is reported below, along with newly available historical newspaper accounts of earlier eruptions. Reports of ash plumes are issued by the Wellington Volcanic Ash Advisory Center (VAAC); the National Disaster Management Office (NDMO) of the Solomon Islands Government also issues situation reports when significant activity is reported. Satellite data from infrared, visual, and SO2 monitoring instruments are an important source of information for this remote volcano. News reports from local (and social) media are often the only sources of information for the smaller events. Recently identified 19th- and 20th-century newspaper accounts of eruptive activity witnessed by sailors passing nearby is a valuable new resource for previously unreported events. Eruption of 21-26 October 2017. Reports of a substantial explosion with an ash plume from Tinakula appeared on social media and in the local press during 22-26 October 2017. Staff from the Lata Met Service Office approached the island by boat on 23 October to make direct observations (figures 17-19). A video clip from the Himawari8 Satellite showing the ash plume explosion was posted by Stephan Armbruster on Twitter on 22 October. The Solomon Islands NDMO issued a situation report on 26 October showing ashfall covering vegetation on the island. According to the NDMO, ashfall was concentrated on the island, although a small amount of ash drifted SE and was reported to briefly contaminate drinking water in several communities in the nearby Reef Islands (60 km ENE) . Ashfall was also reported on Fenualoa Island (50 km ENE) (Radio New Zealand). The eruption was categorized by NMDO as a VEI 3. A team of geologists from NDMO brought seismic monitoring equipment to Tinakula in early November, and measured a high frequency volcanic tremor on 5 November 2017. Figure 17. View from the SE of the eruption at Tinakula on 23 October 2017 during a site visit by staff from the Lata Office of the Solomon Islands Meteorological Service. Photo by Okano Gamara. Figure 18. Ash and steam emissions rose from Tinakula on 23 October 2017 during a site visit by staff from the Lata Office of the Solomon Islands Meteorological Service. Photo by Okano Gamara. Figure 19. Ash emission from Tinakula on 23 October 2017 during a site visit by staff from the Lata Office of the Solomon Islands Meteorological Service. Photo by Okano Gamara. The Wellington VAAC first reported an ash plume visible in satellite imagery shortly after midnight (UTC) on 21 October 2017. The plume was estimated to be at 4.6 km altitude and drifting N. About 90 minutes later they reported a second eruption with a much higher plume drifting SE at 10.7 km altitude using IR imagery cloud top temperatures to estimate the altitude. They reported ongoing ash emissions visible in satellite imagery drifting SE at 6.1 km altitude throughout the morning, dropping to 3 km altitude by the end of the day. The following day, 22 October, intermittent ash emissions were reported at 3.7 km altitude moving E. By that afternoon, they had dropped to 2.4 km, and had lowered to 1.8 km by late on 23 October. Ongoing low-level ash emission (2.1 km altitude) continued through 25 October; by early on 26 October, there was no further evidence of ongoing activity. No MODVOLC thermal alerts were associated with this event, but there was a brief MIROVA signal from the MODIS infrared data during 20-23 October 2017 (figure 20). A major SO2 plume was released from Tinakula on 21 October, and a smaller one was recorded on 28 October as well (figure 21). Figure 20. 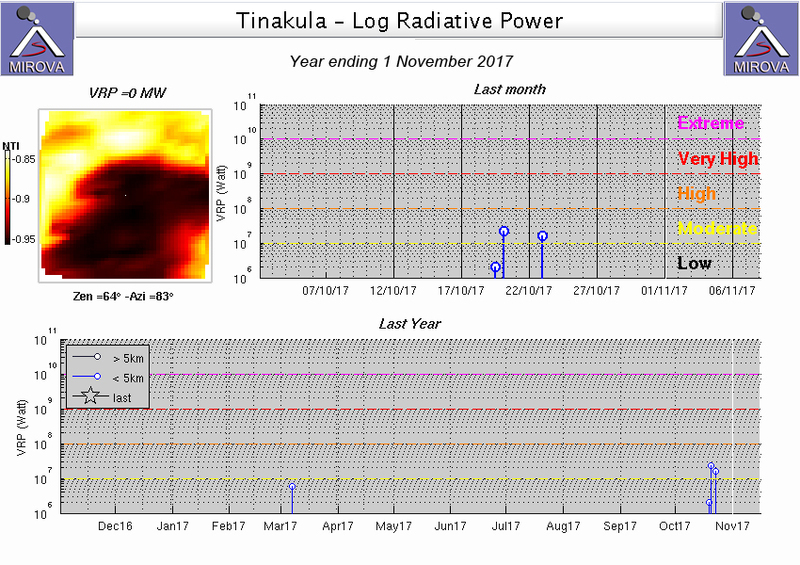 Moderate thermal signals were recorded from Tinakula on 20 and 23 October 2017 (top graph) by the MIROVA system that captures MODIS infrared satellite data. Another signal reported during the first week of March 2017 (bottom graph) could also have been an eruptive event, but no other corroborating evidence is available. Courtesy of MIROVA. Figure 21. Major SO2 plumes from Tinakula and the Vanatu volcanoes of Ambae and Ambrym were released during October 2017. A substantial SO2 plume drifted in several directions from Tinakula on 21 October 2017 (left). Much smaller plumes are also visible from Ambae and Ambrym which are located farther south. On 28 October (right), a smaller SO2 plume was drifting SE from Tinakula while much larger plumes were apparent from Ambae and Ambrym. Data gathered by the OMI instrument on the Aura Satellite. Courtesy of NASA Goddard Space Flight Center. Summary of activity during 1971-2012. After the 1971 eruption, intermittent ash emissions, lava bombs, and pyroclastic flows were reported by geologists and sailors passing nearby in 1984, 1985, 1989-1990, 1995, and 1999. Infrared MODIS thermal data was first reported as MODVOLC thermal alerts beginning in 2000 and has provided satellite-based confirmation of thermal activity since then. Months with thermal activity included February 2000-May 2001, February 2006-November 2007, September-November 2008, August 2009, and January 2010-October 2012 (figure 22). No additional thermal alerts were issued through 2017. Since 2004, SO2 data has been gathered by satellite instruments and processed by NASA Goddard Space Flight Center; in February and April 2006 small SO2 plumes were recorded (figure 23). Figure 22. Months with MODVOLC thermal alerts from MODIS infrared data for Tinakula, during January 2000-December 2017. The orange boxes indicate months where at least one MODVOLC thermal alert was issued; the number of alerts is indicated inside the square. Months highlighted in green represent contiguous periods of time of three months or greater with no recorded MODVOLC thermal alerts. 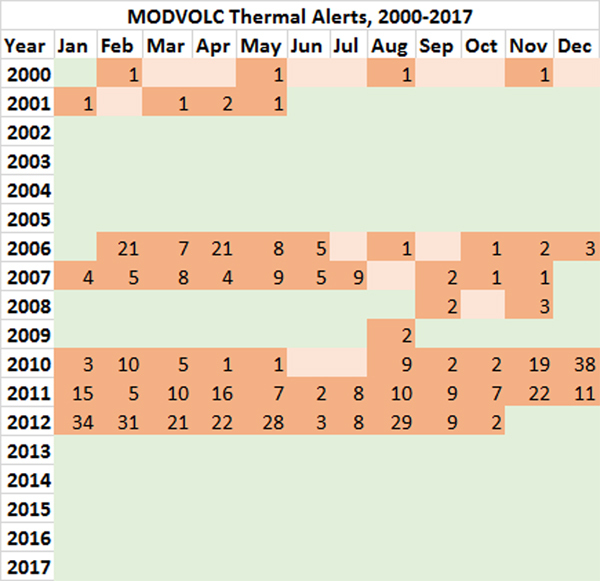 Pale orange squares indicate months with no MODVOLC thermal alerts issued, but within a three-month buffer of an earlier thermal alert. Data courtesy of MODVOLC. Figure 23. 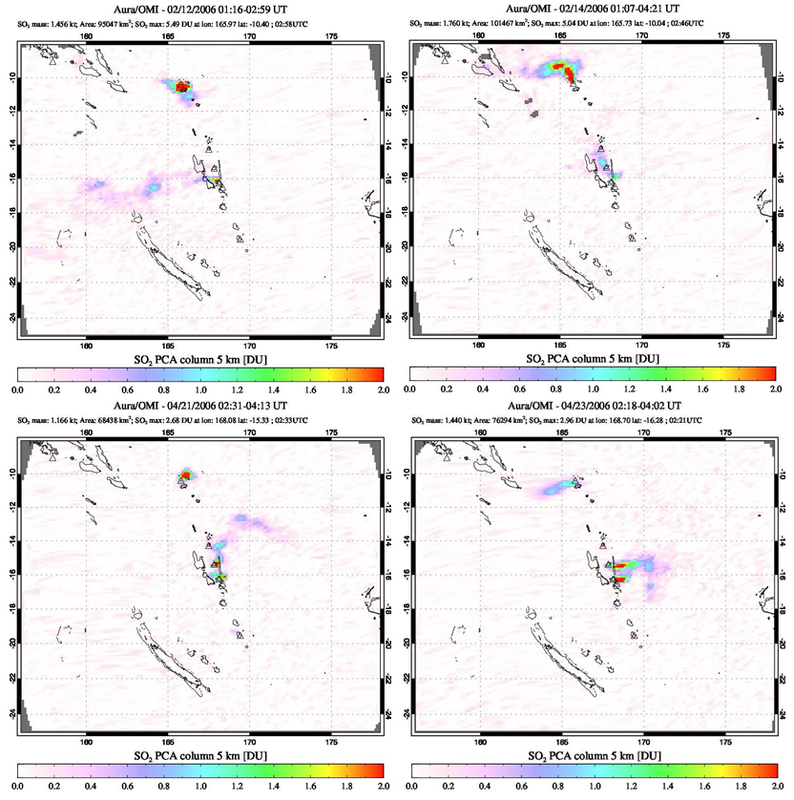 SO2 emission data captured by the OMI instrument on the Aura satellite indicated small plumes from Tinakula (top center of images) on 12 and 14 February 2006 (top) and 21 and 23 April 2006 (bottom). Small plumes were also visible from Ambrym on 12 February, and from Ambae and Ambrym on 14 February and 21 and 23 April 2006. Courtesy of NASA Goddard Space Flight Center. Eruption reports during 1868-1932. Reports of eruptions at Tinakula between 1868 and 1932 have recently been found in 19th and 20th century newspaper accounts from Australia and New Zealand (table 6). The accounts describe incandescence, water discoloration of the sea, explosions, ash plumes, and lava flows extending from the summit to the ocean. Table 6. Newly discovered historical newspaper accounts of volcanic activity from ships passing near Tinakula between 1868 and 1932. This is not a full eruptive history for the time period. Online links provided in the References section. Courtesy of Steve Hutcheon. References. The Age (Melbourne, Victoria) 10 November 1868, page 2b (URL: http://nla.gov.au/nla.news-article177002744). The Empire (Sydney, NSW) 27 October 1869, page 2a, (URL: http://nla.gov.au/nla.news-article60895166). The Sydney Morning Herald (NSW) 19 Februay 1872, page 6a (URL: http://nla.gov.au/nla.news-article13252748). The Daily Telegraph (Sydney, NSW) 1887 20 July, page 4f (URL: http://nla.gov.au/nla.news-article239817295). The Daily Telegraph (Sydney, NSW) 1 September 1910, page 7a (URL: http://nla.gov.au/nla.news-article237993807; http://nla.gov.au/nla.news-article15183461 ). The New Zealand Herald (Auckland, NZ) 27 June 1932, page 6a (URL: https://paperspast.natlib.govt.nz/newspapers/NZH19320627.2.19 ). The Auckland Star (NZ) 10 September 1932, page 1h (Supplement) (URL: https://paperspast.natlib.govt.nz/newspapers/AS19320910.2.180.6 ). Information Contacts: National Disaster Management Office (NDMO), Solomon Islands Government, Prince Philip Highway, Ranadi, Solomon Islands (URL: http://www.ndmo.gov.sb); Wellington Volcanic Ash Advisory Centre (VAAC), Meteorological Service of New Zealand Ltd (MetService), PO Box 722, Wellington, New Zealand (URL: http://www.metservice.com/vaac/, http://www.ssd.noaa.gov/VAAC/OTH/NZ/messages.html); Hawai'i Institute of Geophysics and Planetology (HIGP), MODVOLC Thermal Alerts System, School of Ocean and Earth Science and Technology (SOEST), Univ. of Hawai'i, 2525 Correa Road, Honolulu, HI 96822, USA (URL: http://modis.higp.hawaii.edu/); MIROVA (Middle InfraRed Observation of Volcanic Activity), a collaborative project between the Universities of Turin and Florence (Italy) supported by the Centre for Volcanic Risk of the Italian Civil Protection Department (URL: http://www.mirovaweb.it/); NASA Goddard Space Flight Center (NASA/GSFC), Global Sulfur Dioxide Monitoring Page, Atmospheric Chemistry and Dynamics Laboratory, 8800 Greenbelt Road, Goddard, Maryland, USA (URL: http://so2.gsfc.nasa.gov/index.html ); Radio New Zealand (URL: http://www.radionz.co.nz/international/pacific-news/342267/solomons-pm-calls-for-calm-in-communities-close-to-volcano); Solomon Islands Broadcasting Corporation, SIBC Voice of the Nation, Honiara, Solomon Islands (URL: http://www.sibconline.com.sb/no-its-not-snow-in-the-solomons-its-ash-from-the-tinakula-volcano/); Andy Prata, AIRES Atmospheric Industrial Research and Environmental Solutions, Melbourne, Australia (URL: https://www.aires.space/, https://twitter.com/andyprata/status/922177129944625157); Gamara Okzman Bencarson, Facebook. "Tinakula eruption activity increased. Population evacuated, lava pouring from crater and fissure to sea." Information Contacts: R. Thompson, Geological Survey of the Solomon Islands, Honiara. "Excellent aerial photographs of Tinakula were taken of the erupting volcano on 17 September by map-makers of Australia, and the company navigator, David Gadd gave an eyewitness account. From a study of the photographs it can be seen that at the beginning of the present eruption, ash covered the crater area to an estimated depth of 30 feet and drifts of ash can be seen on the flanks extending 200 m from the crater. The ash may have fallen further from the crater on the summit, particularly on the E and SE flanks where the prevailing wind has carried ash to the bush where the trees obscure it. Rigamoto Nakaera, master of the Belama, described the lava as pouring out of a fissure about 1,200 feet up the W wall of the Cirque caused by the landslide. Steam and white smoke appear to come from the crater. This was confirmed by Gadds observations from the air, who described the lava as pouring out of a crack when it opened about 10 feet. About enough lava to fill five dump trucks came out of the crack in each expulsion and the frequency of the expulsions varied from three in three minutes to one in twelve minutes. The lava, when it first emerged from the fissure, was cherry red even in daylight, and it quickly darkened to black as it flowed quickly down the 65° slope towards the sea. Some of the lava had hardened into a crust about 400 feet above the sea at some constriction and could be seen to exhibit boomerang-shaped ridges on the surface. These, however, got broken up and carried down to the sea by more lava. "A strong smell of the H2S could be smelled in the plane at heights of between 1,800 and 2,500 feet. The sea was discolored for a distance of 500 m offshore and it could be seen to be bubbling violently 25-30 m from the cliff edge where the lava entered the sea. At the time the photographs were taken the lava had built out a buttress to the slope about 60 m wide and 20 m deep. The size of the buttress beneath the sea cannot be estimated, nor can the total volume of the lava expelled, as most of this is beneath the sea. The eruption continues and has increased in severity. "Since the above report was written the island was observed on 20 September by the Bishop of Melanesia, who reported that the single lava flow pushing out of a fissure in the wall of the collapsed face had been joined by another lava stream flowing from the crater which was stated to be 50-100 yards wide. A telegram received from Santa Cruz, a district administrative station 25 miles from the volcano on 25 September, confirmed that evacuation was complete and that the eruption appeared to be getting more violent. The whole island was obscured by white smoke, and red flames could be seen at night. On 27 September earth tremors were reported to be felt on Santa Cruz and the volcano was still shrouded in smoke. So far we have been unable to get any seismological observer to observe the volcano." "On 6 September [at about 1800], the people of Neo village on Trevanion island heard a low, continuous thundering sound coming from the volcano. At the same time a thick dark cloud poured from its summit until the sea between the volcano and Travanion Island, including the two Neo villages facing it, was engulfed in this low-lying thick dark smoke. The thundering sound and the dark smoke went on for about two hours. At about 2000 there was a sudden burst of a louder sound. Simultaneously, a huge flame shot up from the summit of the volcano. This flame was described as later dividing into two corkscrew-like tongues of fire, one slanted to the E and the other to the W side of the volcano. Reports are still coming in from the areas affected by the [tsunami]. At Luesalemba one seagull motor and the canoe were damaged or destroyed. Further up, the NE coast was also affected, according to the reports received. Another flame or fire flared up at about 0300 on 7 September and its subsequent [tsunami] was observed at 0630 traveling NE from the volcano. There has not been a single aircraft or ship going between Santa Cruz and Honiara since the eruption so we have had to rely on non-specialist information. The most recent report has described a big increase of activity commencing on 1 October approximately, when at night large blocks of lava could be seen ejected from the crater and smoke and ash were rising to over 1,000 feet above the cone. The observers were all 25 miles from the volcano. During the day rain and cloud prevented observation. The latest report (5 October) is that the activity has died down a bit." Card 1300 (05 October 1971) R. Thompson, Geological Survey Department, Honiara, Guadalcanal, B.S.I.P. Card 1301 (12 October 1971) D. Dawea-taukalo, Sub Station, Graciosa Bay, Santa Cruz, B.S.I.P. ; R.B. Thompson, Geological Survey Dept., Honiara, Guadalcanal, B.S.I.P. The following is from the cruise report of the USGS research vessel S.P. Lee, engaged in multichannel seismic profiling in the Vanuatu and Solomon Islands areas. The report was written by H.G. Greene, A. Macfarlane, and other members of the scientific party. "On 3 June, Tinakula could be seen 'smoking' in the distance, some 25 km away. As the ship approached the island, large billowing clouds of steam were observed emanating from the summit of the volcano. Occasionally a large, billowing, dark gray, ash-laden plume was observed rising to several kilometers above the island without being disturbed by the prevailing SE trade winds, unlike the steam which was rapidly dissipated by those winds. The emanation of the ash appeared to take place at fairly regular intervals, about every 2 hours. "The Lee passed within 400 m of Tinakula, on a W-E path along the N side of the island, which presented a good vantage point for observing the active vent at the head of the landslide scarp on the NW side of the volcano. As the ship drew abeam of Tinakula, rumbling sounds could be heard from within the active vent, immediately N of the central crater. Boulder-size (football-size) rocks were ejected from the vent, and were still steaming as they rolled and skipped down the steep, N-dipping scree slope and splashed into the sea. At least a dozen of the boulders and much more material of cobble size (65-250 mm in diameter) were seen being thrown from the vent every minute. Much of this debris was accumulating on the scree slope, which is actively infilling the void left by the 1971 landslide. "Geophysical data collected by the Lee showed that another volcanic cone is present about 90 m beneath the surface of the water some 5 km W of Tinakula. This submarine volcano is a little smaller than Tinakula and in consequence not projecting above the sea surface. It has a very youthful geomorphic profile with sharp steep flanks, and appears from its morphology to be active. This volcano lies on the W flank of Tinakula and could be a vent associated with the same magmatic processes that are building the island today. This volcano or volcanic vent has not been identified before and is not on any bathymetric map." Tinakula's last reported eruption started 6 September 1971, preceded by a small tsunami at the island. Intermittent explosive activity built a small summit cone, and incandescent blocks rolled down the volcano's flanks into the sea. A slow-moving lava flow extended about 300 m down the NW flank. About 160 people were evacuated from the island. The eruption ended in December 1971. Information Contacts: A. Macfarlane, Dept of Geology, Mines, and Rural Water Supplies, Vanuatu; H.G. Greene, USGS. On 13 June at 0946 geologists (about 4 km from Tinakula in a boat) observed a vapor and ash cloud rising slowly from the crater. The ash emission was followed about 5 minutes later by whitish vapor, and the eruption cloud drifted slowly toward the W from the crater. Stopping ~50 m from the breached NW side of the volcano, the geologists observed rising steam, and large boulders that rolled down the flank before splashing into the sea. There was no lava flow. During the following two hours, no further eruption was observed as the summit was nearly always covered with clouds. A possible site for a telemetering seismometer was selected on the E side of the volcano at Mendana Cone. Local people reported that the volcano has exhibited similar low-level eruptive behavior since 1984. Following an eruption and tsunami from Tinakula (figure 1) during September-December 1971 (CSLP Cards 1297, 1300, and 1301), there were brief reports of large steam plumes and ash plumes in June 1984 (SEAN 09:06) and June 1985 (SEAN 10:06). This report includes observations from a variety of sources. John Seach has provided information about activity during 1989-90 and 1995, as well as some insight into hazards faced by island residents in the area. Passengers on tour expedition ships noted continuing activity in May 1999 and November 2002. MODIS thermal alerts were triggered on three occasions during January-April 2001. In April 2002 excellent observations of eruptive activity were made by scientists on an Australian research vessel. Figure 1. Sketch map of Tinakula island based on work and publications by G.W. Hughes (1972) and colleagues and summarized by Eissen and others (1991). Observations in 1989-90 and 1995. John Seach observed Tinakula volcano from the Reef Islands (54 km ENE) from August 1989 to February 1990. Typical activity consisted of Vulcanian eruptions and ash emission to 200-400 m above the summit. Eruptions occurred in distinct bursts separated by intervals ranging from minutes to hours. Reports from sailors indicated that lava bombs frequently rolled down to the sea on the NW side of the volcano, and glowing avalanches were observed at night. Tinakula was approached by motorized canoe on two occasions in 1995, but dangerous seas made landing impossible. Ongoing ash emissions originated from the summit area. The upper slopes of the volcano were bare and exposed to gas emissions. Regions of mass wasting on the flanks were common, and blocks of lava and rubble were found at sea level at various locations around the island. However, some of the lower flanks were covered with thick vegetation. During a Solair flight from Santa Cruz to Honiara in late September 1995, activity was observed at the summit crater with ash emissions drifting several kilometers towards the W.
The island has not been inhabited since the tsunami in 1971, but islanders from the outer Reef Islands occasionally travel to tend gardens on the SE flank. The ocean between Santa Cruz Island and Reef Islands is dangerous, with many currents and high seas regularly capsizing boats. Landing on the island is always dangerous due to prevailing swells and the lack of a suitable beach. The dominant SE trade winds blow ash and gases away from inhabited islands for most of the year, but a large eruption occurring in westerly winds may affect populations in the Reef Islands. Volcanic bombs (5 cm in diameter) of an unknown age located in villages on the Reef Islands (over 50 km away) were reported to have fallen from the sky. Observations during May 1999. On the morning of 16 May 1999, Matthew Mumford, on a sailing expedition aboard the Akademik Shuleykin, noted as they approached Tinakula that ". . . a cloud of darkness was blown skyward before our bow. As the ash moved across the sky, the contrast of gray against the white pillows of cloud gave a clear indication of how active this volcano continues to be." MODVOLC Thermal Alerts, 2000-2002. MODIS alerts for Tinakula on 15 January 2001, 6 March 2001, and 16 April 2001 provide objective evidence of continued volcanic activity. The maximum alert ratio was low (-0.75), indicating small-scale activity. The absence of alerts since April 2001 was judged more likely to be because the level of activity has dipped below the -0.8 alert-ratio threshold rather than because of a genuine cessation of activity. Observations during April 2002. Scientists from the RV Franklin briefly investigated Tinakula during the SOLAVENTS expedition, 26 March-21 April 2002. A vent high up on the W flank was actively expelling gas/steam, which could be heard as a low roar 50 m from shore. Small avalanches down the steep W side were common, and one larger eruption observed from the vessel's bridge lasted about 5 minutes. Small optical transmission anomalies were detected in the water column and are probably turbidity induced-particulate plumes. A weak methane anomaly was also recorded ~2.8 km off the NW coast of Tinakula. The following is based on extracts from the daily narrative section of the cruise report (McConachy and others, 2002). The Franklin arrived ~3.2 km off the W coast of Tinakula at 0705 on 6 April 2002 (figures 2-5) and in perfect conditions the Zodiac rescue boat was deployed with Able Seaman Graham and scientists Richard Arculus and Donn Tolia to commence water sampling. The zodiac was safely back on deck by 0815. The scientists reported a roaring noise from Tinakula's active crater heard when the boat was 50 m offshore. Figure 2. Photo showing the N coast of Tinakula as viewed from the zodiac boat off the R/V Franklin, 6 April 2002. The landslide scarp descends to the sea on the NW side of the island. Ndeni Island can be seen in the background S of Tinakula. Photographed by Donn Tolia, Director, Geological Survey of the Solomon Islands; courtesy of CSIRO. Figure 3. Close-up view of Tinakula showing the landslide scarp and embayment on the NW coast. The breached summit crater is mostly hidden by steam emissions. Photographed by Donn Tolia, Director, Geological Survey of the Solomon Islands; courtesy of CSIRO. Figure 4. Photo of Tinakula taken from the RV Franklin, 6 April 2002. Photographed by Susan Belford; courtesy of CSIRO. Figure 5. Photo of Tinakula in the distance taken from the RV Franklin, 6 April 2002. Photographed by Susan Belford; courtesy of CSIRO. From virtually the same location a grab sample collected material from the 1971 eruption at around 950 m depth. An excellent, 75%-full load of exceptionally well-sorted black volcanic sand was recovered, consisting of plagioclase, pyroxene and red-brown fragments; no foraminifera were visible. A CTD-Hydrocast followed at around 0910. During this operation, smoke came from a vent 2/3 way up the summit on the W side of the sector collapse, and minor avalanches came down scree slopes on the N side of the collapse area. A number of light transmission anomalies were observed on the down cast and sampled on the upcast. They are most likely particle plumes following isopycnals (constant density surfaces) sloughing off the main slope. Observations during November 2002. Passengers on the Zegrahm Expeditions cruise ship Clipper Odyssey observed that Tinakula was "active" on the morning of 18 November 2002, but no description of the activity was provided. References. McConachy, T.F., Yeats, C.J., Arculus, R.J., Beattie, R., Belford, S., Holden, J., Kim, J., MacDonald, L., Schardt, C., Sestak, S., Stevens, B., and Tolia, D., 2002, SOLAVENTS-2002: Solomons Australia Vents Expedition Aboard the RV Franklin, 26 March-21 April 2002, edited by C.J. Yeats, CSIRO Exploration and Mining Report 1026F, 456 p.
Hughes, G.W., 1972, Geological map of Tinakula: Nendö sheet EOI 1, Soloman Geol. Survey, Honiara. Eissen, J-P., Blot, C., and Louat, R., 1991, Chronology of the historic volcanic activity of the New Hebrides island arc from 1595 to 1991: Rapports Scientifiques et Technique, Sciences de la Terre, No. 2, ORSTOM, France. Information Contacts: Timothy F. McConachy, CSIRO Exploration and Mining, PO Box 136, North Ryde, NSW 1670, Australia (URL: http://mnf.csiro.au/); Diego Coppola and David A. Rothery, Department of Earth Sciences, The Open University, Milton Keynes, MK7 6AA, United Kingdom; John Seach, PO Box 16, Chatsworth Island, NSW 2469, Australia (URL: http://www.volcanolive.com/); Jeff and Cynthia Gneiser, Zegrahm & Eco Expeditions, 192 Nickerson Street ##200, Seattle, WA 98109, USA (URL: https://www.zegrahm.com/); Matthew Mumford, Unit 1.02, 26 Kippax Street, Surrey Hills, NSW 2010, Australia. Inspection of Terra MODIS day- and night-time data (i.e. original data, rather than the thresholded alert data on the MODVOLC website) for 2001 and 2002 identified cloud-free intervals over Tinakula during January-April 2001, August-September 2001, January 2002, and August-September 2002. MODVOLC thermal alerts were previously reported for 15 January, 6 March, and 16 April 2001 (BGVN 28:01). Recognizable thermal anomalies not noted earlier by the automated system appeared at night on 10 January 2001 (alert ratio, -0.804), and during the day on 25 January 2001 (alert ratio, -0.790). This new information reinforces the interpretation that small-scale activity was occurring during the January-April 2001 time period. According to Simon Carn, volcanic activity at Tinakula appears to have begun on 12 February 2006, with a small explosion followed by degassing. He noted some significant SO2 emissions on 14 February, as well as small plumes from Ambrym and Aoba. As of 16 February, there was still a small SO2 signal from Tinakula, but it was no bigger than that from Ambrym or Aoba. Andrew Tupper noted from visible MTSAT (Multi-functional Transport Satellite) images and an Aqua MODIS (Moderate Resolution Imaging Spectroradiometer) screen shot that a plume on 14 February was moving NNE at ~ 10 km/hour and appeared to be not far above summit level; the plume did not register on the IR imagery. MTSAT is a dual-mission satellite for the Japan Ministry of Land, Infrastructure, and Transport and the Japan Meteorological Agency performing an air traffic control and navigation, as well as a meteorological, functions. 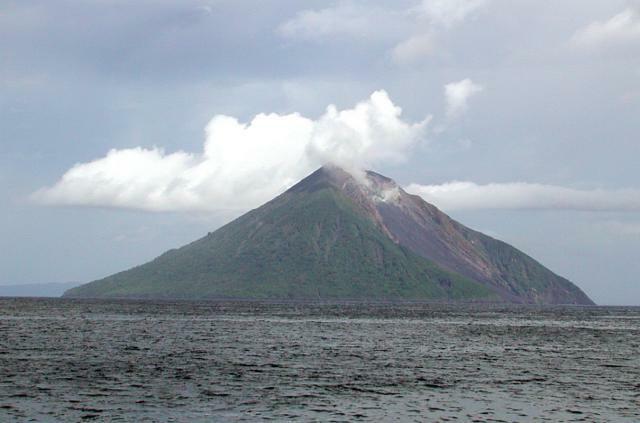 On 27 February, Thomas Toba of the Solomon Islands government wrote to Herman Patia of the Rabaul Volcano Observatory, confirming Tinakula activity. Toba contacted authorities from the Temotu Provincial Headquarters who confirmed that there were several small explosions from this volcano around early to middle February 2006. Satellite thermal-sensor data (using the MODVOLC alert-detection algorithm) revealed a period of thermal anomalies on the uninhabited island of Tinakula during cloud-free intervals in early to mid-February 2006 (table 1). The anomalies were particularly numerous on 11 February. The information was extracted from the MODIS Thermal Alerts website maintained by the Hawai'i Institute of Geophysics and Planetology (HIGP) (see also BGVN 29:06 and 28:01). The satellites used were Aqua and Terra MODIS. Confirmation of the volcanic source of the anomalies was not broadly distributed until late March 2006. Table 1. MODVOLC thermal anomalies at Tinakula for mid-February through mid-April 2006. Since the start of monitoring by MODIS satellite sensors on 8 May 2001, no thermal anomalies had been measured at Tinakula before 11 February 2006. Courtesy of University of Hawai'i Institute of Geophysics and Planetology MODIS Hotspot Alert website. Information Contacts: Hawai'i Institute of Geophysics and Planetology (HIGP), School of Ocean and Earth Science and Technology, University of Hawai'i at Manoa, 1680 East-West Road, POST 602, Honolulu, HI 96822 (URL: http://modis.higp.hawaii.edu); Simon Carn, University of Maryland Baltimore County (UMBC), Joint Center for Earth Systems Technology (JCET), Total Ozone Mapping Spectrometer (TOMS) Volcanic Emissions Group, 1000 Hilltop Circle, Baltimore, MD 21250; Andrew Tupper, Darwin Volcanic Ash Advisory Centre, Bureau of Meteorology, Australia (URL: http://www.bom.gov.au/info/vaac/); Thomas Toba, Ministry of Energy, Water, and Minerals Resources, Honiara, Solomon Islands; Herman Patia, Rabaul Volcano Observatory, P.O. Box 386, Rabaul, Papua New Guinea. No thermal anomalies at Tinakula were detected by MODIS satellite systems between 9 May 2001 and 11 February 2006, but anomalies were then detected through mid-April 2006 (BGVN 31:03). Thermal anomalies continued at about the same pace and intensity (in pixels) through 1 June 2006 (table 2). From 4 August 2006 through March 2007, on 19 different days there were 1- or 2-pixel thermal anomalies measured by MODIS. Table 2. MODIS/MODVOLC thermal anomalies at Tinakula for mid-April 2006 through mid-April 2007 (continued from table in BGVN 31:03). Courtesy of the University of Hawai'i Institute of Geophysics and Planetology (HIGP) MODIS Hotspot Alert System. According to a 1994 summary by the Solomon Island observatory (World Organization of Volcanic Observatories, 1997), "The last reported large eruption was in 1985. Tinakula is highly active [and] erupts andesitic ash almost every week." No recent field observations have been made by scientists. Reference. World Organization of Volcanic Observatories (WOVO), 1997, Volcanoes of the Solomon Islands. 1. Tinakula, (section 0505-07), in Netter, C., and Cheminée, J-L. (eds. ), Directory of Volcano Observatories, 1996-1997: WOVO/IAVCEI/UNESCO, Paris, 50 p.
Information Contacts: Hawai'i Institute of Geophysics and Planetology, MODIS Thermal Alert System, School of Ocean and Earth Sciences and Technology (SOEST), University of Hawai'i, 2525 Correa Road, Honolulu, HI, USA (URL: http://modis.higp.hawaii.edu/); Solomon Island Observatory, Water and Mineral Resources Division, Honiara, Solomon Islands (URL: http://www.wovo.org/0505_07.htm). MODIS thermal anomaly data for Tinakula (table 3) suggests continuing eruptive activity during the period mid-April through mid-July 2007, but no validation by field observations has become available. Similar intermittent anomalies have been detected since mid-February 2006 (BGVN 31:03 and 32:03). Table 3. MODIS/MODVOLC thermal anomalies at Tinakula for mid-April through mid-June 2007 (continued from table in BGVN 32:03); note particularly the anomalies recorded on 11 July 2007. Courtesy of the University of Hawai'i Institute of Geophysics and Planetology (HIGP) MODIS Hotspot Alert website. Several photographs were taken offshore of the island during the February 2006 eruption (BGVN 31:03); figure 6 is an example of some activity during that eruption. Figure 6. Lava blocks tumbling into the ocean on at Tinakula on the morning of 21 February 2006. Courtesy of Bill Yeaton. Information Contacts: Hawai'i Institute of Geophysics and Planetology (HIGP) Thermal Alerts System, School of Ocean and Earth Science and Technology (SOEST), Univ. of Hawai'i, 2525 Correa Road, Honolulu, HI 96822, USA (URL: http://modis.higp.hawaii.edu/); Bill Yeaton (URL: http://www.billyeaton.com/). MODIS/MODVOLC satellite thermal alerts data for Tinakula (table 4) suggests continuing eruptive activity during the period mid-June 2007 through [mid-August] 2009; however, these data lack validation by field observations. Similar intermittent alerts have been detected since mid-February 2005 (BGVN 31:03, 32:03, and 32:07). Table 4. MODIS/MODVOLC satellite thermal alerts measured at Tinakula during the period mid-June 2007 through early December 2009 (continued from table in BGVN 32:07). [Pixels originally reported on 15 February and 4 May could not be confirmed and may have been included by mistake.] Courtesy of the Hawai'i Institute of Geophysics and Planetology (HIGP) Thermal Alerts System. A possible observation of eruptive activity was found on a website by Clark Berge dated 22 September 2009: "A tall plume of steam and smoke streams from the top of a majestic cone rising direct from the sea.... During my visit to Temotu Province last week ... we circled [Tinakula in a motorized canoe], which seemed lush and harmless until we rounded a point and saw the steep black face of stone. Boulders were detaching themselves and bounding down the cliff amid a shower of sparks. I quickly realized the stones were glowing red!" Information Contacts: Hawai'i Institute of Geophysics and Planetology (HIGP) Thermal Alerts System, School of Ocean and Earth Science and Technology (SOEST), Univ. of Hawai'i, 2525 Correa Road, Honolulu, HI 96822, USA (URL: http://modis.higp.hawaii.edu/); Clark Berge (URL: http://brclarkberge.blogspot.com/2009/09/tinakula-volcanoe.html). Tinakula displayed intermittent MODIS/MODVOLC satellite thermal alerts February 2006-November 2007, and September 2008-August 2009 (BGVN 31:03, 32:03, 32:07, 34:10). Ground observations are rare at this frequently active but uninhabited island. No thermal alerts were recorded between 15 August 2009 and 16 January 2010, although there was a ground observation of "steam and smoke" above the summit and incandescent blocks rolling down the flanks in mid-September (BGVN 34:10). Thermal anomalies were detected between 17 January 2010 and 24 February 2010 (table 5). Table 5. MODIS/MODVOLC satellite thermal alerts recorded at Tinakula during 1 January-7 March 2010. Courtesy of the Hawai'i Institute of Geophysics and Planetology (HIGP) Thermal Alerts System. ASTER images of Tinakula over a wide date range are available from the Geological Survey of Japan's Image Database for Volcanoes. One such image (figure 7) shows activity from 13 April 2006 (BGVN 31:03). On the Flickr website there is an image of an eruptive plume on 27 August 2006. Figure 7. False-color VNIR (visible/near-infrared) image of Tinakula taken by the ASTER instrument aboard the Terra satellite on 13 April 2006 (2323 UTC). The image shows a S-blowing plume visible to the image's edge. The island is 3.6 km maximum diameter N-S. A distinct radially directed darker zone trending from the summit to the W side of the island represents a collapse feature (similar to the Sciara del Fuoco on Stromboli), a zone that funneled material from the active crater and remained as an area of ongoing erosion and deposition. In contrast, the rest of the island appears vegetated. [Image is also referred to as Scene ID: 84 187 6.] ASTER images stored in this database are supplied by GEOGrid. Courtesy of the Geological Survey of Japan. Information Contacts: Hawai'i Institute of Geophysics and Planetology (HIGP) Thermal Alerts System, School of Ocean and Earth Science and Technology (SOEST), Univ. of Hawai'i, 2525 Correa Road, Honolulu, HI 96822, USA (URL: http://modis.higp.hawaii.edu/); Global Earth Observation Grid (GEO Grid), National Institute of Advanced Industrial Science and Technology (AIST) (URL: http://geodata1.geogrid.org/vsidb/image/index-E.html); and Advanced Spaceborne Thermal Emission and Reflection Radiometer (ASTER) (URL: http://asterweb.jpl.nasa.gov). Our previous report on Tinakula (BGVN 35:01) summarized MODVOLC thermal alert data through 27 February 2010. This report notes MODVOLC alerts through September 2011. Tinakula is a rarely visited or monitored island in the Santa Cruz Island complex, which is part of the Solomon Island group in the South Pacific ocean (figures 8-10). Figure 8. The location of Tinakula in the Santa Cruz Islands. Courtesy of McCoy and Cleghorn (1988). Figure 10. Stamp from the British Solomon Islands showing Tinakula. Top stamp shows the summit crater emitting a plume and well-developed radial channels with abundant material deposited on the volcano's lower right flank. Bottom stamp illustrates the large scar across the island's NW side. These stamps were featured on the website of Iomoon.com. An image captured on 25 May 2010 by the MODIS instrument aboard the Aqua satellite, showed an ash plume from the volcano. It is not known whether plumes during the time period of this report were frequent. MODVOLC thermal alerts continued through the rest of 2010 and through at least September 2011. During March 2010 through October 2010, the number of alerts ranged from zero to three per month. The number of alerts rose to 10 in November and to 20 in December, then decreased to 11 in January 2011. Between February and 26 September 2011, the number of alerts ranged from two to 12 per month. In July 2011, the two recorded alerts were 4 pixels each, a high during the time period for this report. References. Eissen, J-P., Blot, C., and Louat, R., 1991, Chronology of the historic volcanic activity of the New Hebrides island arc from 1595 to 1991: Rapports Scientifiques et Technique, Sciences de la Terre, No. 2, ORSTOM, France.Hughes, G.W., 1972, Geological map of Tinakula: Nendö sheet EOI 1, Soloman Geol. Survey, Honiara.McCoy, P.C., and Cleghorn, 1988, Archaeological Excavations on Santa Cruz (Nendö), Southeast Solomon Islands: Summary Report, pp. 104-115 (map on 105 and at URL: http://www.jstor.org/stable/40386813?seq=2),in Archaeology in Oceania. Information Contacts: Hawai'i Institute of Geophysics and Planetology (HIGP), MODVOLC Thermal Alerts System, School of Ocean and Earth Science and Technology (SOEST), Univ. of Hawai'i, 2525 Correa Road, Honolulu, HI 96822, USA (URL: http://modis.higp.hawaii.edu/); Iomoon.com (URL: http://www.iomoon.com/). Since our last report of July 2011 (BGVN 36:08), MODVOLC thermal alerts have continued to be measured at a rate of 3 to 11 days per month over Tinakula volcano, a volcano in frequent, if not constant eruption. Thermal alerts occurred over 11 days in January 2012 and 7 in February 2012. This trend of alerts has continued since about August 2010; the eruption is reported to have begun ~September 2008. According to NASA, "Over the past decade satellites have detected intermittent 'thermal anomalies' on the island that suggest eruptions have taken place, but eyewitness observations are infrequent." During 13-14 February 2012, the satellite-borne MODIS radiometer detected a small plume in visible imagery (figure 11a). Figure 11b, a satellite image acquired 14 February 2012, shows a plume of volcanic gas, possibly mixed with a bit of ash, rising above the island's summit. Figure 11. Two satellite images of Tinakula, both acquired on 14 February 2012 and showing a small plume. (a) Image collected by the Advanced Land Imager (ALI) on the Earth Observing-1 (EO-1) satellite. (b) A natural-color view of an emerging plume in an image. Around the island, the reflection of sunlight on the ocean (sunglint) gives the sea water's surface a milky appearance and also makes the ocean wave patterns readily visible. Image collected by MODIS on the Terra satellite. Courtesy of NASA Earth Observatory. Information Contacts: Hawai’i Institute of Geophysics and Planetology (HIGP), MODVOLC Thermal Alerts System, School of Ocean and Earth Science and Technology (SOEST), Univ. of Hawai’i, 2525 Correa Road, Honolulu, HI 96822, USA (URL: http://modis.higp.hawaii.edu/); NASA Earth Observatory (URL: http://earthobservatory.nasa.gov/NaturalHazards/view.php?id=77183). Since our recent brief report on Tinakula (BGVN 37:02), the Bulletin received an informal report from Timothy McConachy of Neptune Minerals, Inc., containing observations of Tinakula volcano made 10 May 2012 (Cook and others, 2012). Most of the following information in the next few paragraphs was extracted from that report. The location of Tinakula with respect to other islands in the Santa Cruz Islands is shown in figure 12; figure 13 shows geological details of the Tinakula volcanic island. Figure 12. The location of Tinakula in the Santa Cruz Islands; inset area shows location of Santa Cruz Islands with respect to New Guinea and Australia. Courtesy of McCoy and Cleghorn (1988). This map previously appeared in BGVN 36:08. Figure 13. Sketch map of Tinakula island based on work and publications by G.W. Hughes (1972) and colleagues, and summarized by Eissen and others (1991). This figure previously appeared in BGVN 28:01 and 36:08. Visit to Tinakula. Cook and others (2012) twice circumnavigated Tinakula clockwise in a banana boat with a 40-horse-power engine in the afternoon on Thursday, 10 May 2012. The day was sunny and clear with minor clouds and a NE breeze which stiffened during the afternoon; cloud cover increased during the afternoon. During the 2 transits they observed recent land slides, the NW collapse area (shown on Figure 13), and steam/gas plumes. A highlight of the visit was when red incandescent boulders of lava bounced down the large scree slope (up to 200-m-wide and 600- to 800-m-long) in the NW collapse sector. As they bounced, the boulders broke into smaller fragments and puffs of stream/gas were seen making white dotted tracks, or 'vapour trails' (figure 14). A number of the fragments from the larger boulders made their way into the sea, and plumes of steam rose along with the splash. When the larger boulders rolled into the sea, the authors could hear thudding sounds as they hit the water, followed by a hissing sound. At times the splash would rise 2 m or higher when the boulders hit the sea. Some of the boulders and fragments did not roll into the sea, but sat on the edge of the water, steaming and hissing for some time (between 3-5 min) before they cooled off. Figure 14. The main scree slope in the NW collapse sector of the volcano, photographed at 1416 hours on 10 May 2012. White patches of steam/gas ('vapour trails') were caused by boulders bouncing down the slope. Courtesy of Cook and others (2012). 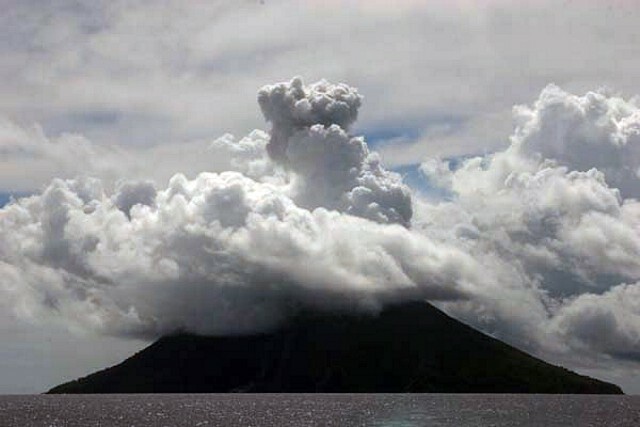 To the naked eye, there appeared to be a steady cloud above Tinakula (figure 15), quite visible even from the town of Lata (~35 km S of Tinakula, located on Graciosa Bay, Nendö Island - aka Ndende Island, the provincial capital of Temotu Province in the far eastern Solomon Islands). It was difficult for Cook and others (2012) to photograph the incandescent color of the boulders and it only became apparent on the second time around the volcano in the later part of the afternoon when the area was backlit by the sun. The boulders originated from an area obscured by steam and gas. When the authors turned the outboard motor off, they could hear rumbling and small explosions at times. The size of the boulders was difficult to judge, but they thought that the larger ones were the size of a small car. They were surprised to see coconut palms growing up the slopes on most sides of the volcano, up to 50 m above sea level, possibly planted by locals. Figure 15. Cloud covering the summit of Tinakula at 1358 on 10 May 2012. The top of the volcano is virtually deforested. Courtesy of Cook and others (2012). Other comments. MODVOLC satellite thermal imagery continued to measure several thermal alerts almost daily. References. Cook, H.J., Koraua, B.L., and McConachy, T.F., 2012, Observations of Tinakula Volcano, 10 May 2012, Solomon Islands (-10.38°S / 165.8°E), Informal report, 12 pp. McCoy, P.C., and Cleghorn, 1988, Archaeological Excavations on Santa Cruz (Nendö), Southeast Solomon Islands: Summary Report, pp. 104-115; in Archaeology in Oceania. Information Contacts: Timothy F. McConachy, Neptune Minerals, Inc. (URL: http://www.neptuneminerals.com); Brent McInnes, Commonwealth Scientific and Industrial Research Organisation (CSIRO), Australia (URL: http://www.csiro.au); MODVOLC, Hawai’i Institute of Geophysics and Planetology (HIGP) Thermal Alerts System, School of Ocean and Earth Science and Technology (SOEST), Univ. of Hawai’i, 2525 Correa Road, Honolulu, HI 96822, USA (URL: http://modis.higp.hawaii.edu/). Since the previous Bulletin report, which noted rumblings heard from the direction of the crater and small explosions emitting molten boulders (BGVN 37:06), there have been no further clear reports of eruptions that have come to our attention. A tectonic earthquake in February 2013 was accompanied by a cluster of foreshocks, a mainshock of magnitude M 7.9, followed by aftershocks. It took at least 10 lives. 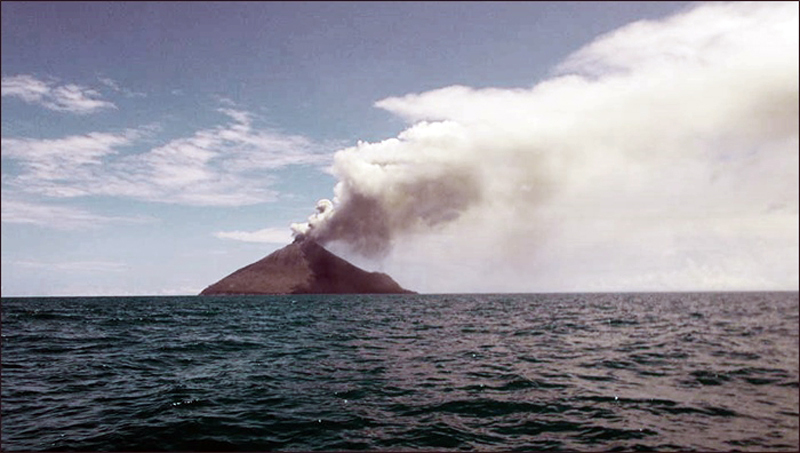 Around the time of the earthquake, 6 February, villagers on a neighboring island noted unusual activity, possibly associated with outgassing or a brief eruption at uninhabited Tinakula. Anomalous volcano behavior. On 8 February, villagers of the island of Santa Cruz, among the closest inhabitants to Tinakula, reported having heard abnormal noises and rumblings coming from the volcano during the previous two days. First-hand reports also noted additional anomalies, including thin cloud cover around Tinakula's summit. The details remained equivocal and there were no similar announcements of uncharacteristic behavior during this reporting interval. The Wellington Volcanic Ash Advisory Centre (VAAC) reported that the significant seismic activity led them to undertake an interval of heightened monitoring for both the volcanoes Traitor's Head in Vanuatu and Tinakula in the Solomon Islands (ICAO, 2014). Moreover, owing to the minor eruption of the volcano Gaua on the island of Vanuatu in April 2013, a Volcanic Ash Advisory was issued for the greater surrounding area, including the Tinakula region. 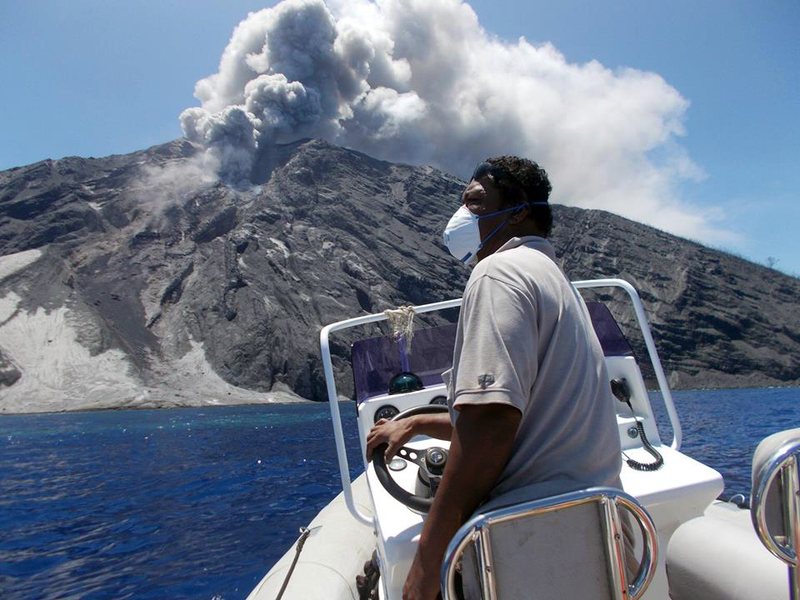 The VAAC continued heightened monitoring through August 2013 due to the ongoing minor seismic activity and minor volcanic eruptions on White Island of New Zealand. The following passages shift our discussion from the volcano to the regional geography and to events associated with the M 7.9 earthquake and tsunamis. M 7.9 earthquake. The M 7.9 earthquake on 6 February 2013 occurred ~100 km SW of Tinakula (at 10.38°S, 165.8 °E), generating tsunamis at numerous monitoring locations (figure 16). As noted below, one aftershock, M 7, struck ~9 km from Tinakula but no damage was reported on the uninhabited island. Figure 16. The relative positions of uninhabited Tinakula and inhabited Santa Cruz (Nendo) Island. Areas of denser white clouds over and downwind of topographic highs are probably attributable to meteorological phenomena, rather than eruptions or outgassing. The 6 February 2013 M 7.9 earthquake struck ~100 km SW of Tinakula. An aftershock struck ~9 km from Tinakula. Tsunamis ravaged coastal settlements on Santa Cruz (Nendo) Island. Courtesy of NASA Earth Observatory. In the days preceding the 6 February event, more than 40 small earthquake events of M 4.5 or higher occurred within 80 km of the M 7.9 earthquake. The National Oceanographic and Atmospheric Administration (NOAA) noted that more than 12 of these were M 5-6; an additional 7 events were greater than M 6. The majority of the seismic activity had epicenters between 40 km SE and 68 km SW of Tinakula with focal depths of 10 to 46 km. Strong aftershocks continued through 8 February 2013. The largest aftershocks in this recording period occurred on 8 February. One, M 7.0, had its epicenter 65 km SE of Tinakula. A second, M 7.0, at 10 km focal depth, had its epicenter only 9 km SSW of Tinakula. Over the course of 6-8 February there were over 100 tsunami run- ups, with typical displacements of 1-2 m. The events spurred circum-Pacific tsunami warnings and collectively took 10-11 lives near the epicenter on islands such as Santa Cruz (Nendo), Tomotu Noi, and Lata. Damage included the destruction or serious damage to 743 houses, as well as a dock at Lata island. The region is regularly rocked by large earthquakes and was struck on 28 October 2013 by one of M 7.7. No abnormal activity from the volcano was noted. Reference. ICAO (International Civil Aviation Organization), (17-20 February) 2014, International Airways Volcano Watch Operations Group (IAVWOPSG); 8th Meeting, Melbourne, Australia, 17 to 20 February 2014, ICAO (URL: http://www.icao.int/safety/meteorology/iavwopsg/IAVWOPSG Meetings Metadata/IAVWOPSG.8.WP.024.5.en.pdf ). Information Contacts: NOAA (URL: http://www.noaa.gov/); and Wellington Volcanic Ash Advisory Centre (VAAC) (URL: http://vaac.metservice.com/). The small 3.5-km-wide island of Tinakula is the exposed summit of a massive stratovolcano at the NW end of the Santa Cruz islands. Similar to Stromboli, it has a breached summit crater that extends from the summit to below sea level. Landslides enlarged this scarp in 1965, creating an embayment on the NW coast. The satellitic cone of Mendana is located on the SE side. The dominantly andesitic volcano has frequently been observed in eruption since the era of Spanish exploration began in 1595. In about 1840, an explosive eruption apparently produced pyroclastic flows that swept all sides of the island, killing its inhabitants. Frequent historical eruptions have originated from a cone constructed within the large breached crater. These have left the upper flanks and the steep apron of lava flows and volcaniclastic debris within the breach unvegetated. Grover J C, 1955. Geology, mineral deposits and prospects of mining development in the British Solomon Islands Protectorate. Interim Geol Surv Brit Solomon Is Mem, 1: 1-151. Hughes G W, Craig P M, Dennis R A, 1981. Geology of the eastern Outer Islands. Solomon Is Geol Surv Bull, 4: 1-33. Markham A H, 1872. The New Hebrides and Santa Cruz Groups. The Journal of the Royal Geographical Society, v. 42, p. 213-243. Markham C, 1904. The voyages of Pedro Fernandez de Quiros, 1595 to 1606. Hakluyt Society, London. There is no Deformation History data available for Tinakula. The northern side of conical Tinakula volcano at the NW end of the Santa Cruz Islands rises dramatically from the sea surface. The small 3.5-km-wide island is the exposed portion of a massive stratovolcano that rises 3-4 km from the sea floor. A large breached crater that extends from the 851-m-high summit to below the NW coast is visible at the right and has been the source of frequent historical eruptions dating back to the era of Spanish exploration in 1595. Ndeni Island (left) appears in the background south of Tinakula. Photo by Donn Tolia, 2002 (Geological Survey of the Solomon Islands, courtesy of CSIRO). An eruption plume rises above weather clouds over Tinakula volcano on February 21, 2006. 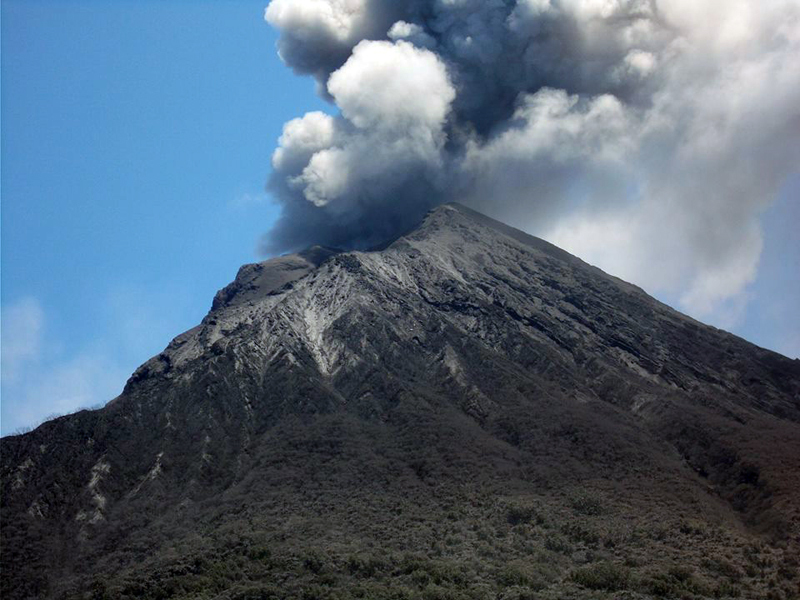 Tinakula had resumed eruptive activity earlier that month. Photo by Bill Yeaton, 2006. There are no samples for Tinakula in the Smithsonian's NMNH Department of Mineral Sciences Rock and Ore collection. Large Eruptions of Tinakula Information about large Quaternary eruptions (VEI >= 4) is cataloged in the Large Magnitude Explosive Volcanic Eruptions (LaMEVE) database of the Volcano Global Risk Identification and Analysis Project (VOGRIPA).